Now that the war in Europe was over, America needed relief from the many years of war. 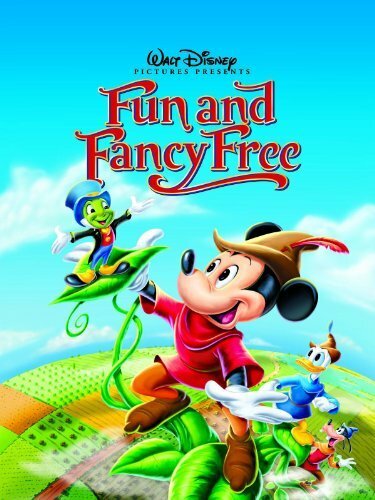 In comes Disney with Fun and Fancy Free, a film consisting of two cartoons joined together by narration from Jiminy Cricket who encourages the audience to enjoy life and live it fun and fancy free. What's interesting is that, despite Jiminy's continual proclamation of a "hakuna matata" life, I didn't find the two cartoons to join in with the same proclamation. We follow the adventures of a circus bear heeding the call of the wild, escaping the savage clutches of the circus masters, stumbling on a group of other bears, and ultimately falling in love. Seems "fun and fancy free" so far right? But Bongo soon finds himself in a love triangle, fighting off a monster of a bear for his woman. Bongo eventually sends him over a waterfall, and only by sheer luck stays alive himself. Eventually he lives happily ever after, but not without going through harrowing circumstances to get there. 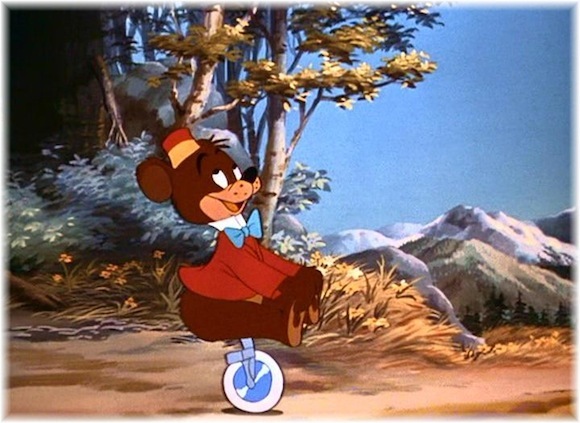 "Bongo" is followed with the short "Mickey and the Beanstalk," the traditional tale of Jack and the Beanstalk retold with Mickey, Donald, and Goofy at the helm. Because of the giant, these three are living in poverty and must sell their only possession, their cow, to afford a last meal. You know the rest of the story I'm sure: the three end up at the giant's castle in the clouds, rescue the magic harp, kill the giant by chopping down the beanstalk, and restore peace and prosperity to the kingdom. Once again, it's a tale where the heroes must overcome great adversity to eventually have a happy ending. It's not a bad story, it just doesn't seem to exemplify the carefree life espoused by the title. These tales don't show the carefree lifestyle; they show the incredible difficulty and hardship required to achieve it. And this is where Disney was on to something. The nation had just been through war, many had sacrificed their lives to save the world, but some may have wondered if it was worth it in the end. This film reminds us that after the adventure/quest/sacrifice comes "happily ever after." We should enjoy peace and prosperity once they are achieved. 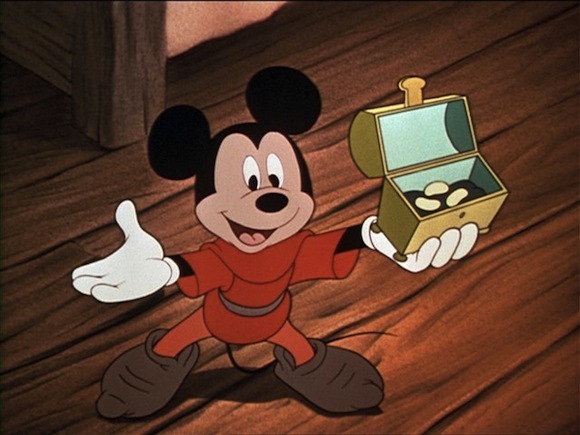 By displaying this story through the heroes on the silver screen, Disney reminds America, and the world, that, yes, the war was tough and brought much hardship, but thanks to the true heroes we all can live fun and fancy free lives. Maybe Jiminy Cricket was on to something after all.